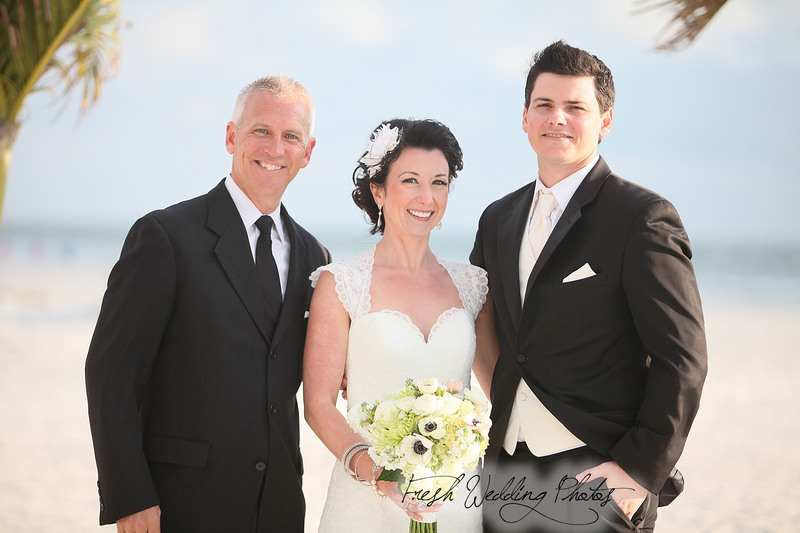 It was a beautiful, windy evening this past Friday at The Grand Plaza Hotel Beachfront Resort & Conference Center on St. Pete Beach for Katrina and Greg’s wedding ceremony! Katrina looked amazing as she was escorted by her father down the Palm Tree lined aisle in the sand to join Greg where, in front of their family and friends, the couple shared their vows, exchanged rings, and were pronounced husband and wife by Rev. Rick Lackore of Sensational Ceremonies . Harpist Victoria Garcia provided the ceremony music; DJ Michael Planas with Grant Hemond and Associates, Inc. did a fantastic job with the ceremony sound; and Katie Shepherd (Catering Sales Manager) and her staff at The Grand Plaza did an amazing job of coordinating all the details for the happy couple and their guests. Photographers Michael and Christopher Giordano with Fresh Wedding Photos provided this picture of the couple with Rev Rick. Congratulations to the new Mr. and Mrs. Greg Brown!